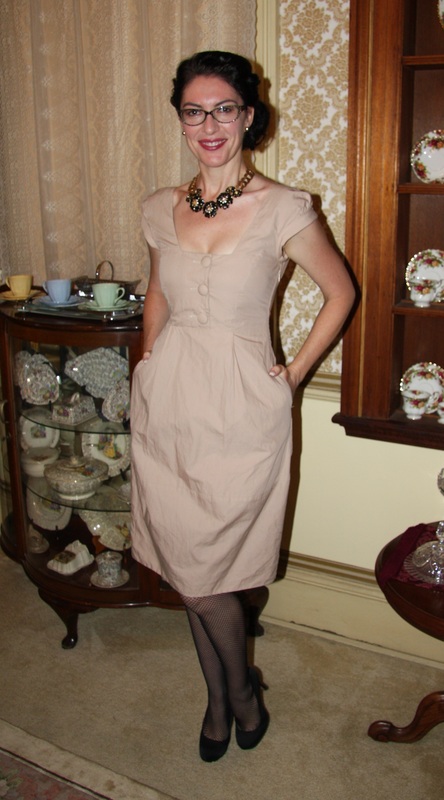 Outfit: Soft brown coloured Empire line dress with buttons to bodice, cap sleeves and a tulip skirt. Hair: Worn in a messy chignon to one side, with a gold lace clip. Accessories: Black fishnet hosiery, gold ball stud earrings, ‘statement’ necklace of black enamel flowers on chunky gold chain, cat’s eye spectacles. As an addendum – I titled this one ‘Iron Will’ because I ironed this dress prior to wearing in the photo twice – once on cotton setting, then on linen, and it still looked quite crinkly! Just the fabric I presume. The dress was too nice not to give an outing, so wore it regardless – however I receive a comment from a colleague that ‘you usually iron your clothes don’t you?’ Ooops!